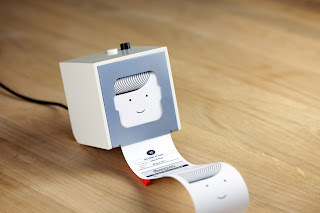 [February 29, 2012] A late November 2011 announcement and accompanying video on The Little Printer from Berg Associates of London created more social media "buzz" around a printer or print-related product than I can remember. While this product/solution, which tied together a small output device with news and other personalized content has yet to ship, the introduction generated great interest, especially on Twitter, and is still receiving attention. What makes this solution so special? I blogged in early December about the tremendous attention Little Printer was receiving, especially on Twitter (see “Little Printer–Big Splash!”) and promised to circle back with more details. I found the company (our usual source of “more details”) to be overwhelmed with all the attention it was receiving, but recently have been able to get through with some questions, and the firm provided some of the background on the “story behind the story” and video development that I reference below. As long time readers know, I have often been drawn to, and covered, the "story behind the story" of new products and other announcements—when and why something takes off in imaginations or otherwise “clicks” with a larger audience. Maybe it is my background in product development, coming from years on the company side, and my myriad of experiences pitching new products, solutions, and strategies to the press and analyst communities and hoping to ignite a spark of interest beyond the usual “speeds and feeds” coverage. Or maybe it is my marketing education, and now years as a marketing educator, remembering the fundamental consumer behavior models like AIDA (Attention/Interest/Desire/Action) that are fueled by something people can get excited about. 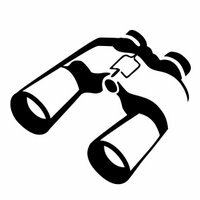 So I am often drawn to the “story behind the story” and speculating, at least, on what it is about certain new products, solutions, applications, whatever, that draws peoples’ attention to one and not another. So just how big is The Little Printer story in the “Twitterverse”, you might ask, based solely on the late November announcement? (And by the way, though the company is difficult to contact, as mentioned above, the “Beta in 2012” still seems to be sometime later than late February 2012, as I write this.) The “500,000 tweets” rumor I reported in the December blog post would appear to be just that, a rumor, and getting actual measurements is not as easy as one might expect. Using Twitter’s own Web-based access can be frustrating when seeking archives beyond a few days old , with typically only about a week’s worth being accessible) but Web sites like Topsy are more effective at rounding up and quantifying social media activity (see below). Storify is another personal favorite but is stronger on the qualitative side (i.e. telling a story through social media) and less strong on the quantitative. Using Topsy, I came up with a count of about 11,000 “Little Printer” tweets since Berg’s announcement, with the huge majority in the early days, but with a healthy number continuing on. For comparison, I picked another recent phenomenon in our industry, Apple’s AirPrint, and in the “status quo” week prior to this blog post, that news had less than 300 tweets, according to Topsy (even with Canon launching two new AirPrint models two weeks prior), while Little Printer had about 400, still drafting off the printer’s nearly three-month old announcement. Which got me thinking—what about using Google Trends as a popularity index? A few readers might remember I highlighted some industry stalwart brands and some new ones, in a Google Trends analysis more than three years ago (see “Observations: Reading the Google Tea Leaves— How are Printers Faring?”). For a refresher, Google Trends reports, over time going back a number of years, the number of Google searches on specific terms and the number of news story references. Well, in addition to finding that those long ago trends were still heading in the same direction (that’s a whole other story, but see teaser graphic below), I found that just these interest indices do not really tell the story like they once did. The number of news stories on “Little Printer” is quite low, actually, but with the “democratization” of journalism, much of which has taken place over the three-and-a-half years since my “Tea Leaves” column, that number may not be nearly as important a metric as our social media references. This tendency, of course, is the essence of “viral,” at least where Twitter is concerned, and “viral” is most often applied, at least in the vernacular of the day, to videos (maybe it’s the alliteration), and Wilton added, “Perhaps the best thing for your article to is look at the way the studio uses film. It's one of our main methods of communicating the products that we make.” The blog post in question, “Sometimes the Stories are the Science,” is written by Matt Jones, principal at Berg, and contains some great references and rationale on what makes great videos, going back to Apple’s legendary, and visionary, “Knowledge Navigator” of 20 years past and borrows its title from one of my favorites minds, as well one of Jones’, writer/thinker Oliver Sacks. As the blog post points out, as much as things change, telling the whole story (the solution/content along with the story) is what is compelling. Thus, printers are just printers unless they are more, which seems obvious if not downright condescending. But combining output with that device and other devices and showing how a printer can change and improve the user’s day to day life, even in a small way, and that can include adding in a little amusement to the daily routine. We can see the success of this approach from the appeal of The Little Printer. Also lesson is to embrace and not fight change—the video shows The Little Printer’s close integration with the smartphone and its apps. The Little Printer is a complementary product, not one that fights with the clear superiority of mobile viewing devices at their best, but one that just makes the point that in some cases a little hard copy neatly fits the bill. And just as social media can boost the popularization of a product or concept at rocket speed, it can also induce a little backlash or alternative views. In searching the “Little Printer” tweets in preparation of this column, I enjoyed seeing just such an alternative, which just goes to show that success loves company.